Disney's Deluxe Resorts are the Contemporary Resort, Grand Floridian Resort and Spa, Polynesian Resort, Wilderness Lodge, Boardwalk Inn, Yacht Club Resort, Beach Club Resort, and Animal Kingdom Lodge. For the sake of consolidation, we'll also include the Villa Resorts in this post, which are part of Disney's timeshare program called the Disney Vacation Club. Villas offer larger accomodations that can include up to three bedrooms, three bathrooms, and a full kitchen. 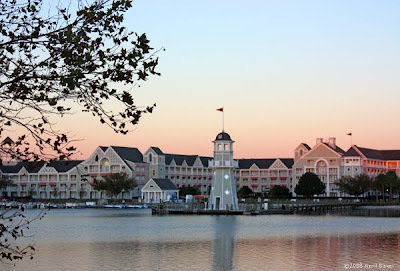 These resorts are Bay Lake Tower at Disney's Contemporary Resort, Disney's Boardwalk Villas, The Villas at Disney's Wilderness Lodge, Disney's Beach Club Villas, Disney's Animal Kingdom Villas (Jambo House or Kidani Village), Disney's Old Key West, and Saratoga Springs Resort and Spa. The latter three are resorts that are exclusively villas while the others are sort of extensions of Deluxe Resorts. All of these are Disney's highest priced resorts and you will find that they are highly themed and designed with luxury in mind. They boast extra amenities that range from prime locations (some are on the monorail line), fantastic pools (Yacht and Beach Club have a water park with a sandy-bottom pool and a tremendous slide), and two even have full-service spas. As in our previous posts on the Value Resorts and Moderate Resorts, I will not cover basic amenities and room sizes for you. The official Disney site will give you a basic overview, and then AllEars.net can give you the finer details. If you prefer print, the Unofficial Guide to Walt Disney World and the Passporter guide both have excellent resort overviews. Instead, let's once again look at the pros and cons of these resorts for families. Your "pro" may be my "con," so take them as the opinions they are and hopefully they will still help you decide if a Deluxe Resort is best for you. Location, Location, Location! - If you want a resort within walking distance of a park, it will be a Deluxe Resort. The Grand Floridian, Polynesian and Contemporary are all on the monorail providing easy access to both Magic Kingdom and Epcot. The Contemporary (and Bay Lake Towers) are within a fairly easy walk to Magic Kingdom as well and all the monorail resorts have rooms with views of the Magic Kingdom. Boardwalk, Beach Club, and Yacht Club are all an easy walk from World Showcase at Epcot. They are also a longer, but doable walk from Disney's Hollywood Studios and they have an active nightlife integrated into the area, including restaurants, nightclubs, and shops. The Animal Kingdom isn't so much close to the Animal Kingdom Park (although it's not far), but it also incorporates that park into it's theming, with wild animals literally strolling through your backyard. Room Size - These are the biggest rooms on property, and even in the standard room (as opposed to a Villa), you have ample space for storage, sleeping, and hanging out. They have balconies, which are often a lovely feature to have after the kids are asleep and you want to actually hold a conversation with your significant other. Bed Size - Queen-size beds are standard in the Deluxe resorts (as opposed to double beds in the Value Resorts). There are also rooms with King beds if you have an infant in a Pack and Play or if you decide to leave the kids with grandma and take a grown-ups only trip. Refrigerators and Kitchen Facilities - Mini-fridges are standard in Deluxe Resorts. Villas that are one, two, or three-bedroom have full kitchens and a washer/dryer set, while studio villas have a microwave and mini-fridge only. Architecture - I wasn't sure what else to call this, but basically, these resorts are the top-of-the-line in the design and theming end. The lobby at Wilderness Lodge will take your breath away. The opulence of the Grand Floridian is stunning. And walking into the Polynesian is just like you've left the beautiful state of Florida and stepped right into Hawaii. If you are going to Disney World to lose yourself in the fantasy and forget about the real world, a Deluxe Resort is a perfect place for that. Mind you, to be fair, the Moderates and Values also have an "other-worldly" quality that provide fabulous escape as well. Amazing Pools - So amazing, in fact, that some of them are marketed as water parks, and not without reason. Slides, freestyle shapes, zero-entry, and other gimmicks make these places worth your time outside the parks. If you decide to stay in a Deluxe Resort, make a strong effort to set aside some time to enjoy the pools. Interior Entrances - The Deluxe Resorts are the only level of resort that has a main entrance with interior access to all rooms. This is, in my opinion, the safest way to go. Although the main doors are by no means completely secure, they are visible to staff at all times and there are no dark corners for potential criminals to lurk in. Food Choices - The Deluxe Resorts have some of the best dining options on property and offer all types of choices, from snacks to quick service to upscale dining. Although all properties afford some dining choices that will ensure you won't starve, the Deluxe resorts offer restaurants that are unique enough to draw people to them from all over the Walt Disney World property. In fact, if you decide that a Deluxe resort is not in your budget, I highly recommend eating at one or two of their restaurants. The food and service will be excellent, and you will get a chance to poke around the lobby and grounds of these luxurious resorts. Cost - Standard room rates for these resorts can start as low as $240 and go up from there. Way up. At Christmas, the regular rate for a room at the Polynesian can soar to just under $900 a night. Old Key West is generally considered the least expensive Villa Resort, and those rooms (standard rate) range from a Studio for $295 in the least expensive season to almost $1700 per night for a three-bedroom during the holiday. Of course, there are often discounts and other specials that could save you some money on these rates, but this at least gives you an idea of where to place them in cost. Formality - Although the grand architecture and luxurious setting may please your adult sensibilities, your children might really prefer the whimsy of the Value Resorts. They are far more playful in tone than the stately Grand Floridian, which may remind them more of Aunt Nancy's house where they aren't allowed to sit on the furniture or touch anything. So there are my pros and cons to the Deluxe resorts. What are yours? We love to hear from you in our comments! I know many don't care much about the room or property while at WDW, be we've found we use the hotel as much as the parks so we really enjoy the ammenities of the deluxe resorts. Don't get me wrong.....I'll take a trip to Disney and pretty much be happy with ANY property. But we pretty much exclusively stay at the deluxe properties--our favorite being the Grand Floridian. Our kids are teens now, but they've been staying at the deluxe resorts since they were infants and we've never felt they couldn't enjoy and be themselves. In addition, we've made great friends at many of the properties. The Yacht & Beach clubs have a great pool, the Grand Floridian and Poly share a great beach with water sports and now movies on the GF beach, they all have great restaurants and other things we've enjoyed during each stay. We stayed at the Boardwalk for the first time this past June and LOVED that location as well. While I've enjoyed Pop Century, All Star Sports & Music and some of the moderate resorts, there is nothing like a deluxe resort for pampering and grown up activities! After all, it's my vacation, too!! Love the WDW deluxe properties!! Bu you said the "Interior Entrances - The Deluxe Resorts are the only level of resort that has a main entrance with interior access to all rooms. This is, in my opinion, the safest way to go. Although the main doors are by no means completely secure, they are visible to staff at all times and there are no dark corners for potential criminals to lurk in." If you are on the first floor of the lodge you do have access to walk right out of your room to the pool, ect. So you do have more access there than just the main entry. Same with my last stay at Saratoga Springs. An upper level room was outside access too. But I have just discovered this blog thanks to StudioCentral.com's recommendation, and I really like it! I deduced that there could be a potential for savings if you're in a deluxe resort within walking distance or on the monorail loop just by shear timing. If you're not waiting on a bus, how much time might you save that you get to experience in the park? I might actually consider the luxury enough to knock off a day that i might spend at a value or moderate resort and see some savings there. After some fume-filled bus-waiting in my last trip (at Caribbean Beach), I am anxious to look at luxury and convenience the next go around! In my experience, the bus services to and from the deluxe resorts are nowhere near as consistent as those at the value resorts. This makes sense because the number of guests is smaller, but it's something to think about if you don't like to wait a long time for a park bus. I always enjoy staying at the Disney monorail hotels for the convenience of the location. My favorite is probably the Polynesian Resort. 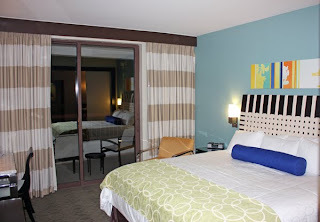 We made the "mistake" of staying ta the Contemporary Resort for our first WDW stay. From there on we were hooked. My family and I have stayed at most of the Disney Resorts. Our favorite is the Beach Club Villas. Not only can you walk around the bay to the Boardwalk but you can walk to Epcot and Hollywood Studios. When Epcot guest start heading out the front after the fireworks show, you can take a stroll out the back of the park to the Beach Club or Boardwalk. No lines, no traffic, no hassle! There is a great new site Disneysecrets.com that reviews all the resorts and ameneties. I highly recommend it. You can also go to Disney.com to get alot more info. Chloe, Hannah and Luke from Disney From a Kids Point of View. We have stayed at the Yacht Club and the Polynesian. We absolutely loved the experience! We loved running on the beach at both places. We also loved the theming. Both times they were unexpected upgrades which were a magical surprise. My DH and DC have stayed at almost all the deluxe resorts and some of the moderate. We have not stayed at economy, so cannot speak to those. Our vacations are our magical time and we save and sacrifice to make it the best. Our favorite moderate is by far the Port Orleans - French Quarter. It is not too large that you get lost like some of the others and the theming is wonderful. We always rent a car if staying here. Coming up in October we are staying at the AKL and are so excited. We even opted for Concierge level. We can speak to how wonderful the DVC Villas are as well, since we used to be members. We tended not to use the kitchen though. We did love having an extra room and washer/dryer. What we love about not having it is the ability to stay at so many other locations if we wish. My favorites are Polynesian (for theming, location, and food), Animal Kingdom Lodge (for theming and food). 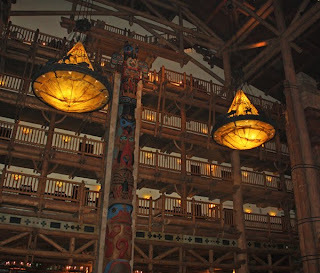 I love the Wilderness Lodge, but being from the Pacific NW, I want to experience a different theme than what I am used too. Vacation is what you make of it and just do what you can afford and enjoy each and every magical moment. I absolutely love the convenience of staying at the Polynesian! If you can afford it, you are right the location is just perfect. Cuts your travel time to the parks down so much! Loved all your info on the resorts! I love Disney World. I grew up in Southern California and went to Disneyland all the time, but I must admit that Disney World is my favorite. But I have never been to Disneyland France. That is next on the list I guess. I love and admire all things Disney, but nothing more than the fine art. The artists behind Disney are wonderful. I have a shop on Etsy where I put up my own disney art but I will never be as talented as Walt Disney. I don’t know how I have never seen your blog. But I love it! Thank you for putting in all the time to run such an awesome Disney resource. Best service provider that could save your time, money and give you immense relief from hassles that usually comes with packing process.